Proposals for Gallions Quarter, a large scale regeneration in Beckton, have received planning approval from London Borough of Newham. The significant regeneration prospect to the east of the Royal Albert Dock consists of four phases and will deliver up to 800 new homes in total, alongside parks, shops, cafés, a health centre and community space. 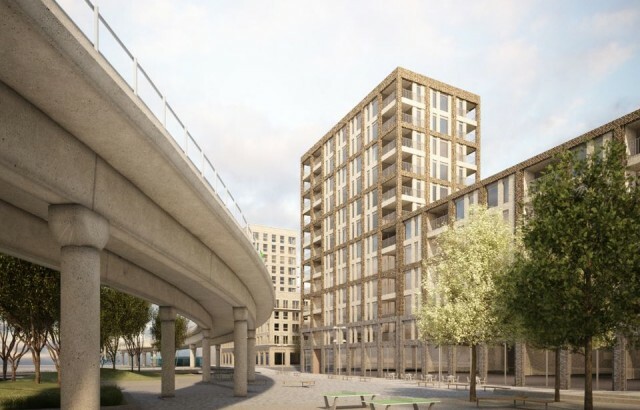 A consortium of developers (Notting Hill Housing, Linden Homes and United House) successfully bid for the 44 ha GLA site and appointed three architects to create outline proposals within the Maccreanor Lavington masterplan. As part of this we worked up proposals for two plots for Linden Homes. These blocks are on the perimeter of the site adjacent to the DLR station and new Gallions Park, and will rise from four to 12 storeys, respecting the existing local context whilst maximising views of the new public open space and river beyond.